Our travertine cleaning process typically involves the use of our travertine steam cleaning unit (up to 1200 psi) providing for the most effective travertine cleaning method for your stone. Effective and through travertine tile cleaning is crucial for a smooth looking uniform finish and proper sealing. Our unique state-of-the-art travertine floor cleaning process will yield you MAXIMUM soil removal in cleaning your travertine tile. We relish our client’s “Aha Moment” when they see their squeaky clean travertine tile floors. Our cleaning tool pulling out dirt and grime collected in the pits of the Travertine and the grout lines revealing a much cleaner and brighter floor. Our Penetrating Sealer Technology is unleashed over all the grout. 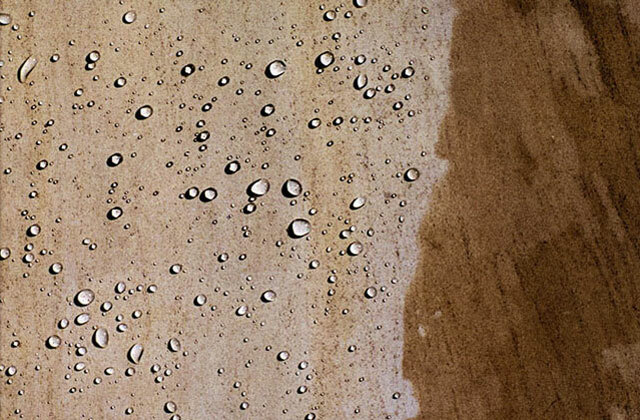 The penetrating sealer molecules are hundreds of times smaller than competitor stone sealers and penetrate much deeper into the pore structure. Travertine must be sealed to minimize the potential for staining and etching. We will seal all the travertine tile with our same Penetrating Sealer Technology, to provide a clear natural molecular sealer look. The result is a fresh look, like no other – tile at its purest and most protective state. We provide you with our Stone Care Guide at the completion of our services, which provides specific instructions for the cleaning and maintenance of your travertine and other natural stone. In many instances, when cleaning travertine that is even moderately soiled the process may uncover surface scratches, small holes, and even hairline cracks that are disguised from the soiling. Similarly, the travertine maintenance cleaning may dislodge fill in the travertine that is not stable. Our travertine repair or travertine honing process will adequately address most of those issues. Cleaning travertine floors is our passion. Are you ready to get your travertine looking new again? Are you ready to clean, restore, and protect your travertine floors, counter-tops, and/or showers? If you are ready then give us a call at (214) 763-8832 to set up an appointment for a FREE estimate. We promise no high pressure sales tactics, no gimmicks, and no ‘bait and switch’. Why not call us right now while it is still on your mind. Don’t Delay – Call TODAY! Click here to receive your free, no-hassle quote for cleaning travertine service.